Allegra Boverman/Gloucester Daily Times. During the Sailbot 2013 events on Monday afternoon at Maritime Gloucester, Kaleb Church, a Gloucester High School junior and member of the Fishermen team, finetunes his boat's software so it's ready for competition again. 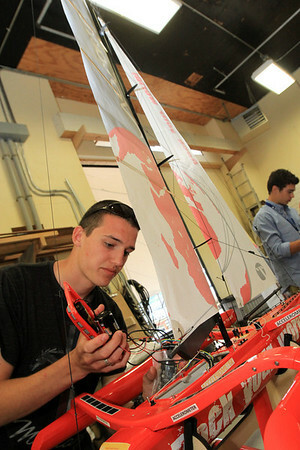 Alec Reduker, a freshman at Newburyport High School, far right, is working on his team's boat, The Iron Horse.